Silverlight 4 supports printing scenarios. It’s quite easy. Just create a PrintDocument instance, handle the PrintPage-Event and call the Print-Method. In the PrintPage-Event set the PageVisual-Property of the PrintPageEventArgs to a UIElement of your choice. If there are more pages, set the HasMorePages-Property of the PrintPageEventArgs to true and the PrintPage-Eventhandler would be called again for the next page. Below a simple example using a lambda expression. 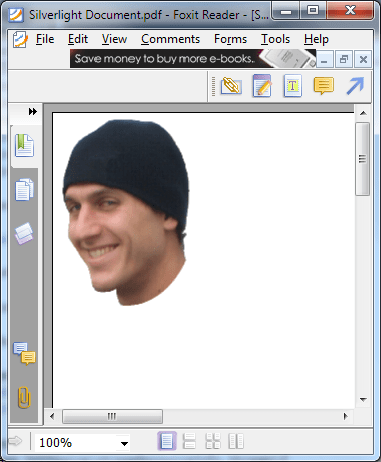 When the Print-Method is called a PrintDialog is displayed to the User, where he can select the printer of his choice. When the PrintDialog was accepted, the PrintPage-Event gets fired and the lambda expression below get’s called. The PageVisual-Property is set to a TextBlock. So that TextBlock with the text “Thoams says…” is printed out. Ok, so far so good. As I was working on an example for my upcoming Silverlight 4 book I needed to create an Image-Element on the fly and print this out. And then I noticed that the Image doesn’t appear on the output. So, it seemed it was not my cause, it was a Beta-cause. So let’s look at a workaround. But first look at the bug. I made a smaller example to reproduce it. View the following code. What do you think is printed on the page? Right, an Image should be printed on the page. But it isn’t. The page is empty. Well, the next thing I tried was to call Measure, Arrange and UpdateLayout on the Image to force a layout-pass. But anyway, it didn’t work, the printed page is always empty. I still believe this is a Beta issue, hopefully it will be fixed in the RTW version. For example, Images are not working neither on a DataTemplate for an ItemsControl when you set that ItemsControl as the PageVisual. Yes, i also think that it’s a beta issue. I think they will fix it for the rtw. what a load of crap silverlight is . how can microsoft make this all so hard. this is not even a beta issue!!! the printing api is pitifull, the documentation appauling. Yeah, it looks like it has to inherit from UIElement (or FrameworkElement), i.e., a GUI control. The printout info gets rendered prior to printing, so everything comes out as an image. This is such a bummer. Many thanks! Saved me a ton of frustration and time.